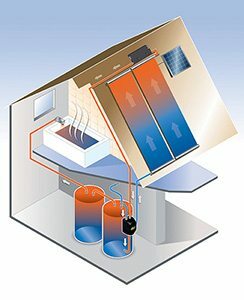 Are you ready to go solar thermal? 1. Solar thermal collectors collect the sun’s heat. 3. Heat is then transferred to the water via the heat exchanger. 4. The heat creates hot water for your domestic hot water needs. 5. The heated water is stored in an insulated storage tank for later use.